I have heard from a number of you asking for more comments on substances that I have known. After nicotine, alcohol was next on my list of bad habits to come to terms with. And although cigarettes and tobacco are pretty much guaranteed to kill you in the end, alcohol comes damn close and is, in my experience, a lot more destructive emotionally and psychologically. While tobacco definitely harmed me big-time and is also in the process of killing many people I care for, alcohol has been far more destructive to friends and extended family in actuality. Let me start out with a side-effect of alcohol that I discovered for myself, one that few drinkers are aware of, but most are subject to. A day to a day-and-a-half AFTER drinking alcohol, I notice a very clear psychological change. It does not appear the morning after (when all the physical symptoms show up), but later on and more subtlety. I become more emotional and vulnerable to the loss of confidence and self-assurance. Perhaps this is the ‘depression’ that is often associated with alcohol that we read about. This effect is similar to that of being prone to getting a cold when our resistance is down. Our immune system is impacted somehow. It is the same with alcohol, but psychologically. A short time after drinking (in the next day or two) I tend to feel bad about myself, to take offense more easily, and to get a little paranoid and defensive. In other words, I become vulnerable. Of course it goes away in a day or so after that UNLESS I drink again, in which case the effect compounds itself into a syndrome and then I really have trouble getting out of it and finding my self-confidence once again. Those who drink regularly (and are susceptible) gradually lose their sense of self confidence and can’t regain it easily. They can get irritable and mean. This IMO is the plight of the alcoholic, a downward recursive syndrome that gradually destroys confidence and, if not counteracted, eventually life itself. This effect also happens for the casual drinker, so check this out on your own and see if you are vulnerable. I have verified this syndrome with many drinkers. And now, my take on alcohol. Unlike cigarettes, which had a death-grip on my lungs, alcohol has been somewhat kinder overall to me personally. I never really got addicted to alcohol. I was never an alcoholic, although many I knew (and know) are. Back in the day I liked to drink socially, but I was not one of those people who would drink alone. It never occurred to me. In my case, alcohol was always an excuse to be social, to throw caution to the wind and tell everyone how much I loved them. I was never a mean drunk, just a stupid one, a ‘drunk’ drunk. And I was not much into the hard stuff. Sure, back in high school we used to drive down to Toledo Ohio where we could buy near-beer, and dare each other to drink a 16 oz. tumbler of straight whiskey all at once, usually in the back of a car, and then watch ourselves throw up all over the street. That is what passed for fun back then. What were we thinking? For me it was always just wine and beer, and after a while (a wine drunk is tough on you) it was just beer, and I like pilsner. 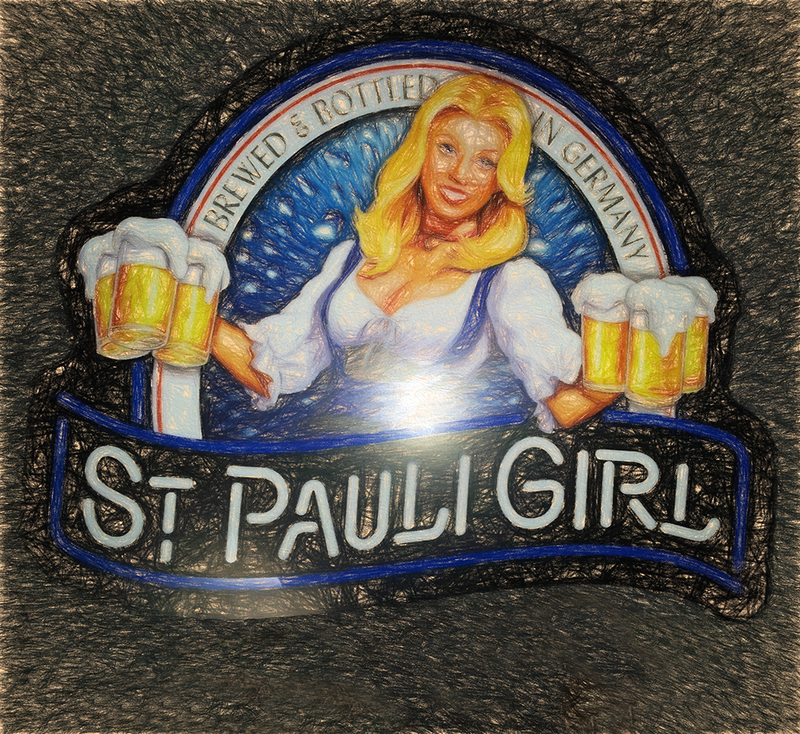 My favorite beer brands were St. Pauli Girl and Becks. I never went for the dark lagers. Too sweet. I like it bitter and clear. Somewhere between the high school hard-stuff and the later beer, I had a fling for wine, but I soon got cured of that, and more than once. Very early on, like in 1960, I lived in Venice West on Santa Monica Beach trying to be a beatnik, although that movement was already pretty-much over. At that time I thought I was an artist; I painted in oils and lived in an abandoned walk-in refrigerator in the basement of a somewhat famous Beat art gallery right on the beach called the "Gas House." I remember going to a party in a little house of a friend of mine along the beach, the legendary poet and conga player Tamboo (a.k.a Curtis Smith), and his woman ‘Mad Marge’. I had with me half a gallon of cheap wine. I must have been nineteen years old at the time and far from my home in Ann Arbor, Michigan. I so desperately wanted to be a beatnik. When I came through the door of the house where the party was being held, there were two federal narcotic agents waiting. They were frisking each person as they came in, looking for dope, and paid no attention to my wine or the fact that I was underage. They didn’t even check my ID. I was directed to sit down along a wall with a string of other folks who already had gone through the same routine. So there I sat while the feds continued to welcome each new person as they came in. Needless to say, I was very nervous. In my nervousness I opened the wine and started to take a sip or two. Well, before I knew it I had drunk the entire half gallon all by myself. Later, free once again and outside, I puked my guts out for hours. Nothing makes you sicker than a wine drunk, especially sweet wine. I vowed never to drink wine again. As it turned out, I had to repeat that procedure several more times in my life before I really got the message. As I got a little older, my idea of a good time was to get one of those pretty little bottles of Mateus rosé wine, a loaf of French bread, some good olives, a block of French feta cheese, and have a picnic. I believe I did that when I was courting Margaret, my wife. It was great fun. But for me alcohol was mostly about beer. Even in the band days, when we were traveling all over playing blues music, it was beer I was drinking and sometimes too much. However, all in all, I am not a drinker. When that first flush of alcohol wore off and I had hugged everyone I should hug, instead of trying to go higher, I would usually lay off, drink some water or coffee, and work it out of my system, etc. I knew I could not push the envelope higher and get away with it, and my constitution is too sensitive to withstand heavy drinking. This is one of the few areas in my substance-life where I managed to display any common sense. But social drinking did hang on in my life for many years. Like all my vices, as I began to age, I no longer could get away with what I easily shook off as a younger man. I can remember one time at a wedding of a friend (and housemate), I drank until I was about the last person there. I was asked to leave. Later, at home, I can remember being so terribly cold with a shaking fit that my kind wife had to put me in a bathtub of hot water just to keep me warm and get my body temperature back up. Now that was drunk. As I aged I drank less, but the hangovers became worse and lasted longer until it was obvious even to me that this habit was on a downward spiral. By that time the recovery was not worth what little fun remained in the drinking. And this was not just an isolated incident. I put it to the test, many, many times, to make sure that there was no mistake. In the end, there was no mistake. My drinking days were over. When that was perfectly clear to me, I took Buddhist lay vows which include not ever drinking again, and I never have. Of course, I did not give up anything that I had not already given up and worked out of my system, so where’s the sacrifice? There wasn’t any. I have never missed drinking other than perhaps the smell of good beer and I guess I still perk up at the sight of the labels of my favorite brands. Their logos are imprinted in my brain. The bottom line is that I never really was addicted to alcohol other than perhaps socially. However, I really should say something about those around me who have not been so fortunate. As mentioned, for me alcohol was never a big problem, but for many of my friends and loved ones that is not the case. If I look at all the vices I have seen in my life in those around me, none has been as rampant and destructive as alcohol. “Hells-Keyhole,” a play on the word ‘alcohol’, was what my teacher Andrew McIver called it. I have seen it systematically destroy life after life. We all know this by now, or should. Over the years I have had many, many alcoholic friends who are trying to get free of the stuff. Nothing is quite so dispiriting as to phone a dear friend and hear them struggle to control their speech so you don’t known they have been drinking again. Of course you know right off. They have fallen off the wagon once more and are in deep trouble, even to the point of asking for money to survive. Many end up in the hospital. Still others can’t bring themselves to ask for help and have not even admitted to themselves that they have a problem and are sick. And even today I know many younger musicians who like to drink and do it too much, but they would never believe they are alcoholics or already too far down that road to return. They would not admit to having a ‘real’ problem, yet they drink almost every day or so. Who are they kidding? Although I don’t care for the overly-religious tone of ‘Alcoholics Anonymous’, it really does work. I have seen it do wonders for friends of mine, some who find themselves going to meetings even two or three times a day! I have never been to a meeting myself, but many people I know have and it has literally saved their lives. I have had friends die of drug overdoses, hang themselves, etc., but nothing I have seen so systematically destroys lives, marriages, and families as alcohol. It is an almost perfect killing machine, and I don’t need to go on and on about it. Hopefully, we all know about alcohol.